According to the Bureau of Labor Statistics (BLS), jobs in healthcare are among the fastest growing in the U.S. — above many other industries. While the most recent GDP growth report shows fourth quarter economic growth at 1.9 percent, annual rate of change for home health care services (4.8 percent), outpatient care centers (4.1 percent), other health practitioners (3.8 percent) and other health care fields are in a boom. 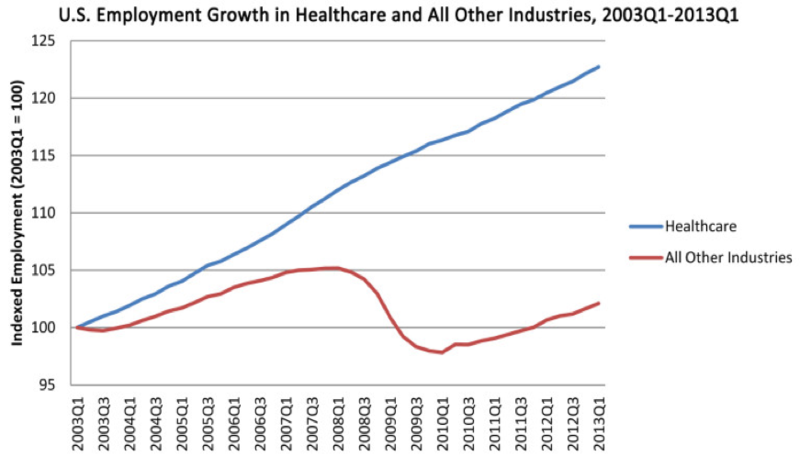 “Over the past decade, the healthcare industry has added 2.6 million jobs nationwide. The industry’s 22.7 percent employment growth rate over that period significantly outstripped the 2.1 percent employment growth rate in all other industries,” says one Brookings report, which found healthcare to be the nation’s largest economic sector. As America’s largest generation, Baby Boomers, ages healthcare is expected to become a leading industry. The need for administrators — leaders who understand both managerial leadership and acumen as well as the healthcare industry are in high demand. The BLS reports jobs in Healthcare Administration in particular — Medical and Health Services Managers — growing at a rapid 17 percent, or 56,000 jobs, by 2024 — significantly faster than average. The William Woods University Master of Healthcare Administration helps fill this need. Over the course of two years, the program, completely online, covers ethics, terminology, technology, human resources management, case studies, finances and law, all with a key focus on the healthcare industry.